Artist’s impression of the JDN8069 cutter suction dredger (CSD). Image courtesy of Jan De Nul Group. A graphical image representing the side profile of the cutter suction dredger. Image courtesy of Jan De Nul Group. The JDN8069 CSD will be powered by MAN L/V 48/60CR medium-speed marine diesel engines. Image courtesy of MAN SE. A new cutter suction dredger (CSD), designated JDN8069, is being built by Uljanik Brodogradiliste shipyard in Pula, Croatia, for Jan De Nul Group. It is expected to be the world’s biggest cutter suction dredger, when operational in 2017. Jan De Nul Group awarded a contract to Uljanik shipyard for the large self-propelled CSD JDN8069 in March 2015. The vessel will be delivered in February 2017. "MAN Group was awarded a contract to deliver MAN L/V 48/60CR medium-speed marine diesel engines for the CSD vessel in August 2015." MAN Group was awarded a contract to deliver MAN L/V 48/60CR medium-speed marine diesel engines for the CSD vessel in August 2015. The 48/60CR is one of the most successful engine types utilised in dredging vessels. The engines will be produced at MAN’s main production plant located in Augsburg, Germany. JDN8069 CSD was designed in-house by Jan De Nul. The design of previous seven large self-propelled cutter suction dredgers served as a basis for the new CSD concept. The new vessel will offer approximately 50% more power than J F J De Nul, which is the world’s biggest cutter suction dredger currently operational. JDN8069 will have an overall length of 151.3m, breadth of 36m, draught of 5.75m and dredging depth of 45m. It will be outfitted with accommodation facilities for carrying 67 personnel. The vessel will be fitted with a rotating cutter head, which can cut hard soil into fragments. The onboard suction pump with a diameter of 1,100mm will take in the cut soil. The material will then be pumped ashore using a 1,100mm discharge pump or a 1,000mm barge loading pipe for loading into a split hopper barge moored alongside, which in turn can then offload the dredge sediment at the set location. The self-propelled CSD will cut the soil according to a pre-programmed mode, where the vessel will be stationed during the dredging. The vessel will feature a dynamically controlled, flexible spud carriage system, which will actively control the longitudinal movement and force during the dredging. The cutter head, cutter drive and the suction pipe will be mounted on a flexible cutter ladder with suspension. The dredger will be provided with vibration reduction means to absorb the shock-loads and vibrations during rock dredging. Dredging and marine contractor, Van Oord placed an order with Damen shipyards for a new cutter suction dredger (CSD) in January 2015.. The cutter-head drive, dredger and booster pumps will be equipped with gearboxes supplied by RENK. The diesel-electric propulsion system will include a MAN 14V48/60CR and two MAN 9L48/60CR medium-speed marine diesel engines coupled to three step-up, RENK Rheine gearboxes for a diesel-electric plant. 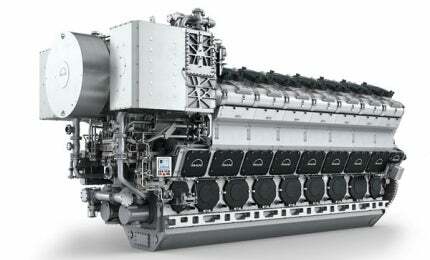 Each MAN 14V48/60CR engine will develop a power of 16,800kW, whereas the 9L48/60CR engine is rated at 10,800kW. The engines burn heavy fuel oil (HFO)/marine diesel oil (MDO) or marine gas oil (MGO). The V48/60CR engine’s specific fuel oil consumption (SFOC) at 80% of maximum continuous rating (MCR) is 173g/kWh. The power-plant will develop a total power of 40,975kW, of which 6,000kW will be supplied for the propulsion, 8,500kW for the cutter, 17,000kW for the onboard pumps and 8,500kW for the submerged pump. The propulsion system provides the vessel a speed of 12kt. The 48/60CR engines are equipped with advanced, in-house-developed technologies such as high-efficiency, TCA-type, exhaust-gas turbochargers, modern electronic fuel injection (EFI) systems, and MAN SaCoSone engine safety and control system for monitoring and diagnosis.